I am an evolutionary biologist interested mainly in the process of adaptive evolution in the context of coevolutionary systems. I use diverse methods to study these phenomena, including evolutionary biochemistry, biophysics, and phylogenetics. I am particularly interested in how adaptive coevolution can be understood at the molecular, functional, and phenotypic level. 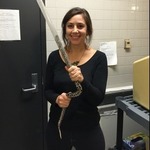 I am currently a PhD candidate in the University of Minnesota’s graduate program in Ecology, Evolution, and Behavior co-advised by Dr. Sharon Jansa and Dr. Antony Dean. Though the study of coevolutionary relationships has been a focal point of evolutionary biology, demonstrating a truly reciprocally evolving interaction at the molecular and functional level in an empirical system has remained elusive. My current research focuses on understanding the molecular and functional history of traits involved in an interspecific coevolutionary arms races. I have studied evolutionary dynamics of several systems including marsh grasses, Diamondback Terrapins, and the Vegas Valley Leopard Toad. My current work focuses on coevolutionary interactions between mammals and venomous snakes. Campaign ended, but science continues! Claudia, SO excited to hear about your interest! That's terrible about the copperhead bites! Where were they located?